02.20.2007 - I'm going to misspell squirrel as squirell for this blog entry, so that any internet searches searching for help with a squirrel problem might find this page. Squirrels can cause many problem, but of course the most common is squirells in the attic. Some people have me trap and remove and relocate squirells just because they are causing other problems outside, such as chewing on wood or stealing bird food, but most of the time, I deal with squirells inside homes. Most squirell control revolves around trapping and removal. The nuisance squirells need to be taken away from the property. In the case of critters in the attic, I can sometimes install a one-way exclusion door to get them to go out but not get back in, but with squirrels this tactic can backfire, because these rodents will work very hard to chew their way back in, and thus they can just create destruction with the chewing, and then get back in anyway. 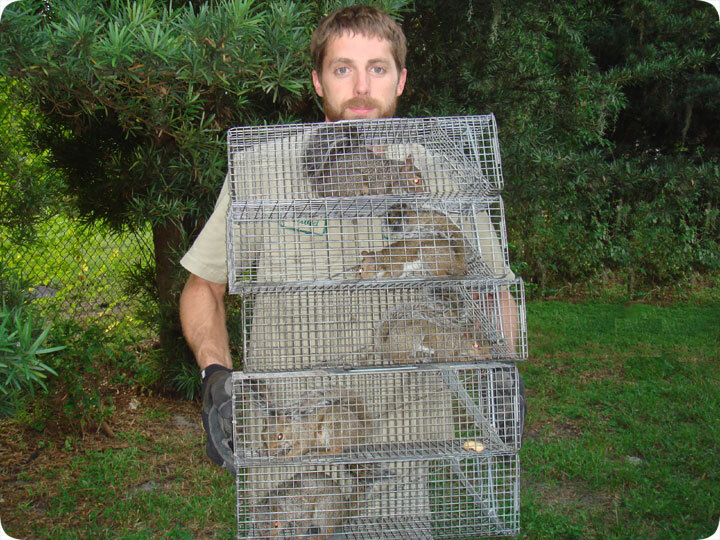 Thus, I most commonly end up trapping the squirells in cage traps. Most homes have multiple squirrels. At first, it's just a female squirell that has entered the house in order to make a nest and have babies. Homeowners don't always notice when it's just her. But then the 3-5 young grow up, and in about eight weeks they are adult size, and you've got a whole bunch of critters running around in your attic! I usually have to trap and remove about five squirrels at that time, such as seen in the above photograph. Once all the squirells are out of the attic, it's important to permanently seal all of the entry holes leading into the home, or else you will have more critter problems in the future. Animals tend to leave a scent behind, and once you've had them, new ones find their way in. The Eastern Gray Squirell (Sciurus carolinensis), is one of the most widespread nuisance animals in the country. It lives throughout most of the United States. It is arboreal (likes to live in trees), but just as commonly atticeal (likes to live in attics). It's a member of the rodent family, and is prone to chewing and gnawing. Squirells are active during the daytime, particularly morning and evening. They are active year-round. They give birth to two litters of young per year, in late summer and late winter, commonly inside buildings they've chewed into. They are very agile and great climbers, and are active animals. They are cute, but often destructive, especially when they enter an attic.